if cancelled up to 4 weeks before arrival, no fee will be charged, if cancelled later up to 2 weeks before arrival date, the first night will be charged. if cancelled later or in case of NO-SHOW ,the total amount will be charged. 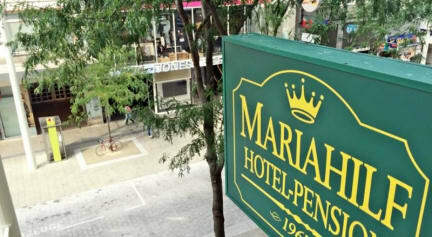 Our Hotel Pension Mariahilf is an excellent choice for individual and business travelers; we provide you with comfortable and quiet rooms at very convenient prices. On request we can arrange a taxi pick up and make reservations for sightseeing tours, theatre and concerts. We wish our guests a pleasant stay in Hotel-Pension Mariahilf and in Vienna. Parking area is available at a discount price. We are proud to invite you for breakfast in Merkur, one of the best pastry shops ( Modern- and Air conditioned atmosphere), in Vienna. On Sundays and holidays, the breakfast will be served (same high quality) in our lobby area! Hotel Pension Mariahilf is a first class, family-run Hotel-Pension situated in the City Centre right on the 'Mariahilfer Strasse Nr.49', the oldest and most famous shopping street in Vienna. 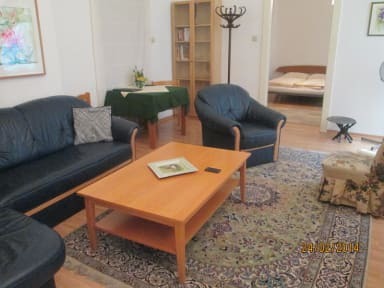 The famous 'Ring Strasse' and the historical sites are in walking distance from the Hotel-Pension. The subway U3 has stops in front of the Hotel. All of our rooms complete with bath/shower, WC, cable TV, Internet access (wireless), radio, mini bar, telephone. For most comfortable stay we would be pleased to reserve for you one of our apartments provided with shower, WC, telephone, cable-TV, mini bar and kitchen for short or longer periods. Check in from 13:30 to 22:00 . If your arrival is after 22:00, please contact us to arrange it. The City Tax of 3.2% is not included in the price. Not warmly greeted and briefed like other hotels. Did not have a good stay there, definitely not worth the $100 I paid to stay there for the night. I have had better experiences at hostels. I made a last minute reservation through hostelworld around 20:30. I arrived to the hotel at 22h, only to find out that no one was there. I called the owner and he told me it was not possible for me to stay since it was too late. I would expect that if it's too late, it should not be possible to reserve a place at all. Yet I paid for it, and the owner was not interested in helping at all. Also, the security was clearly non-existent, since all the doors were open and anyone could get in.